This entry was posted on August 6, 2015 by Tinteán Editorial Team/EMcK, in News, What's On... and tagged Australian History, Kelly Country, Ned Kelly, Redmond Barry. Bookmark the permalink. Features Anthony Penhall as Ned Kelly. A musical drama by Felix Meagher (with additional music by Lou Hesterman and Cyril Moran) about the trial and execution of Ned Kelly in November 1880. 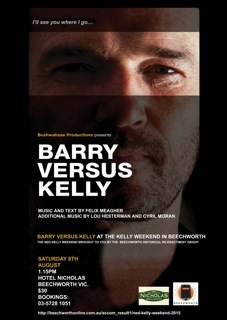 Barry Versus Kelly focuses on the confrontation between Ned and the Judge, Sir Redmond Barry. Barry, whose harsh sentencing of Ned’s mother, Ellen, to three years goal in 1878 sparked the Kelly Outbreak, is haunted by Ned’s last words to him.’I will see you where I go.’ Barry is fiercely determined to see Irish rebels like Ned Kelly punished, but he fears he might be making a martyr out of Ned. Declining in health and suffering delusions, Barry wrestles with his conscience and the fears that his family in Ireland sees him as a traitor. Meanwhile Ellen Kelly, on the day before the hanging, sings to Ned that he is the Loyal Son.